KUALA LUMPUR: The high-speed rail (HSR) development connecting Kuala Lumpur and Singapore will catapult both cities into the league of mega cities. It will also raise the prospect of closer economic integration between the cities, MyHSR Corp Sdn Bhd chief executive officer Mohd Nur Ismal Kamal told Business Times. He said the HSR will provide an opportunity for both cities to be stronger and more attractive as a gateway to Asean. “Now the focus is on mega cities and how agglomeration creates more growth. By population, Kuala Lumpur ranks 72nd among the 300 largest cities in the world while Singapore ranks 84th. “Through economic integration between the two cities, together with Singapore we would rank 28th in terms of population and 11th in terms of gross domestic product (GDP). ll cities and towns along the corridor will see a new impetus in terms of economic development. Nur Ismal said global references indicate that integrating development planning with HSR delivery helps economic outcomes. The integration between Kuala Lumpur and Singapore could resemble the way London-Paris, Tokyo-Osaka and Madrid-Seville interact, he added. London and Paris are linked by the Eurostar high-speed train across the English Channel. The Eurostar brought about increased tourism and economic integration between the United Kingdom and Europe. Nur Ismal said studies conducted for Malaysia last year indicate long-term economic impact from the HSR development. 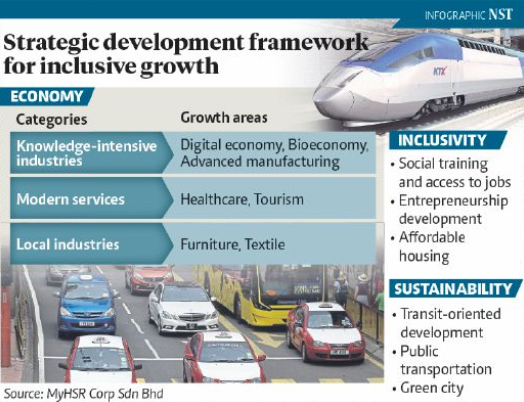 “The wider economic benefits stemming from the HSR project is estimated at RM21 billion of GDP in 2060 with 111,000 jobs created based on a World Bank study on other international projects. As such, there is a need to look at maximising the benefits and spurring development in Bandar Malaysia, Putrajaya, Seremban, Ayer Keroh, Muar, Batu Pahat and Iskandar Puteri. All cities and towns along the corridor will see a new impetus in terms of economic development, he said. “We need to be able to channel investments specifically for cities that have HSR stops. “We have started to work with the Malaysian Investment Development Authority, InvestKL and state agencies as well as sectors to promote investments,” Nur Ismal said.